As we try to learn more about earthquakes and the geologic forces that create them, we can look in two directions—to the present and to the past. Earthquakes that happen today are well recorded by seismometers, but we have to wait for them. In the meantime, we can cover more time by searching the past. A good recent example is a study mapping a San Andreas Fault earthquake that happened in 1838, long before we had seismometers. The paper in the February Bulletin of the Seismological Society of America, written by Ashley Streig and Ray Weldon of the University of Oregon and Tim Dawson of the California Geological Survey, described some of the painstaking work needed to document earthquakes in the "pre-instrumental period." It combines written information from dusty archives and geological information from mucky ground. Earthquakes last only moments; despite the destruction they can cause, they don't leave many lasting traces. Broken buildings are usually cleared away and rebuilt; toppled trees rot away; landslides don't stand out from those that happen every wet season. This is especially true in the deep woods of the Santa Cruz Mountains, where the San Andreas Fault runs through thinly settled country. But Streig's team found a little stream valley along the fault's trace at a locality called Hazel Dell, near the small town of Corralitos north of Watsonville. Here they did a trenching study and documented three large earthquakes—more precisely, three instances of movement on the fault—during the last two centuries. Trenching is a kind of dissection of the ground. The photos below are from a trenching exercise that I witnessed a few years ago. Here are the steps. 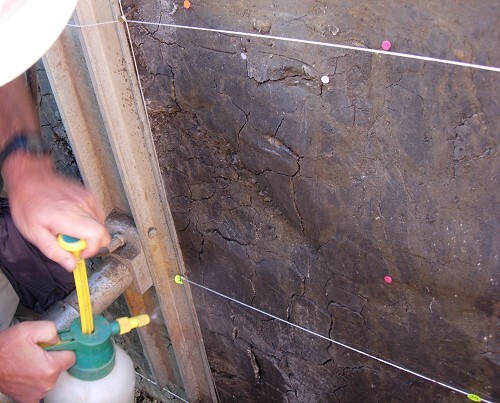 First, very carefully map the traces of the fault and pick a spot to dig a trench across the fault, using a backhoe. 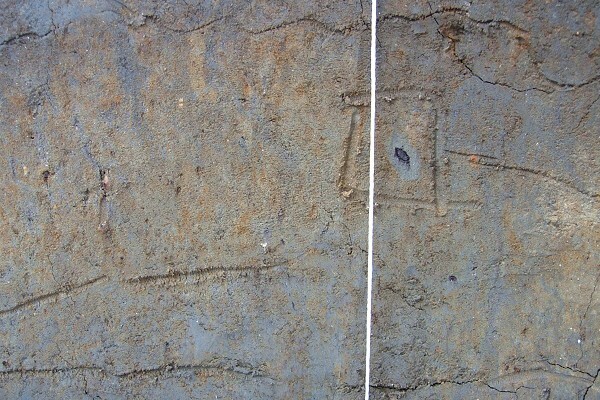 Insert steel braces in the trench to hold the walls safely up. Next, take hand tools and carefully scrape both walls of the whole trench to best display the layers under the ground. Set up a precise grid of white string and start mapping whatever you can discern. Mark the boundaries of whatever you see—color changes, different textures, offsets and discontinuities—using a trowel or twig. 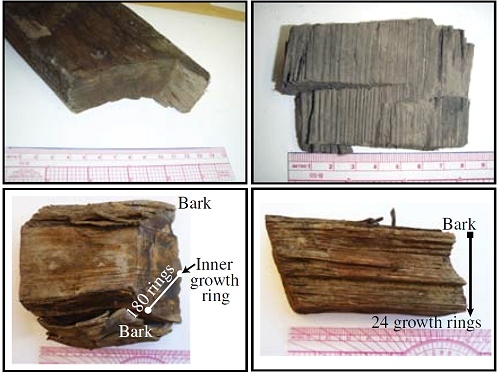 Mark bits of wood or charcoal that could be dated by radiocarbon. 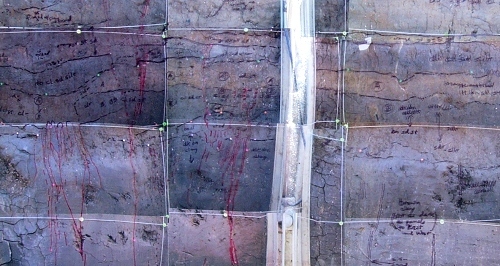 A possible bit of charcoal, or more likely an old plant root, is outlined on the trench wall along with other features. Lay clear plastic over the trench wall and transfer onto it everything you've marked. Add notes. Photograph everything in good light. Print the photos and start pasting them together. Keep pasting the photos until a complete mosaic is assembled. Roll up the plastic sheets and photomosaics, pack up the samples, pull out the braces and refill the trench. Almost done with the fieldwork! Take everything back to the lab, assemble it into a database, run tests on the samples, and scratch your head and stare at everything for a long time. It's an incredible amount of work, but trenching is the only way to pin down prehistoric and pre-instrumental earthquakes. Not every trench pays off, either. Streig's team did this at Hazel Dell in sixteen places over the course of three years. They picked the site because a stream running nearby has regularly flooded the spot, laying down a series of mud layers that are relatively easy to map. A big break came with the discovery of redwood chips in one of those layers that could only have been cut by a modern steel ax. Historical documents tell us that logging began here in the early 1800s, and carbon dating of the chips gave dates in the same range. 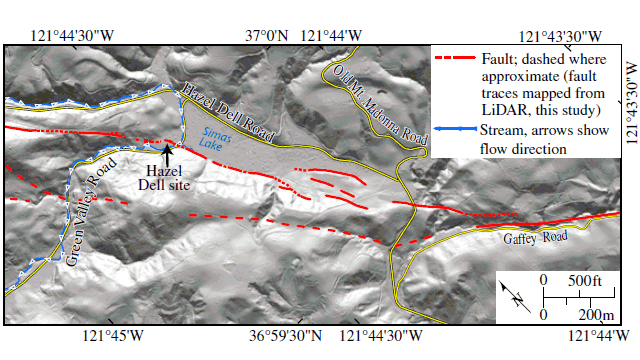 In their paper Streig's team documented fault offsets from known quakes at Hazel Dell in June 1838, April 24, 1890 and April 18, 1906 plus a fourth, earlier seismic event. This precise record helped them tighten the less precise data from other trenches along the fault, and the history of fault activity in all of the Santa Cruz Mountains snapped into better focus. The data from Hazel Dell fits a model of earthquakes on the San Andreas Fault in which huge quakes (like 1906) that rip long segments of the fault interrupt an ongoing series of smaller quakes. It also fits another model in which smaller quakes lead up to the biggest ones in a supercycle or "earthquake storm." And it fits a model in which earthquakes are essentially random. But that's part of a bigger conversation in earthquake science. Human records, like official documents and letters written by the local inhabitants, are a crucial part of this kind of research. For an example, see the database of eyewitness accounts of the 1811-1812 New Madrid earthquakes in the Mississippi Valley, compiled by the University of Memphis. And more documents turn up all the time. Earthquake scientist Sue Hough told me, "Letters with earthquake references languish in a million places: tucked away in archives, posted online at least for a while." She studies early California quakes and is always looking for more documentary data. 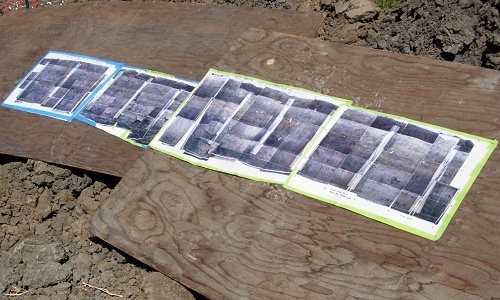 We don't all have the know-how to do trenching studies, but we can all read old letters. Think of them as "Did You Feel It?" reports from the past. The 1838 earthquake could have been recorded by hundreds of people. With each new testimonial retrieved from oblivion, no matter how small, people today can add to the permanent record.